As ULEZ launched earlier this week Ethos – experts in asset finance have decided to advertise on our TXE Electric taxi this year to promote their finance deals on electric cabs. #TheElectricBroker #WhatCantWeFund campaign includes full livery and tip up seats. Visit https://www.ethosfinance.co.uk/ to find out more. 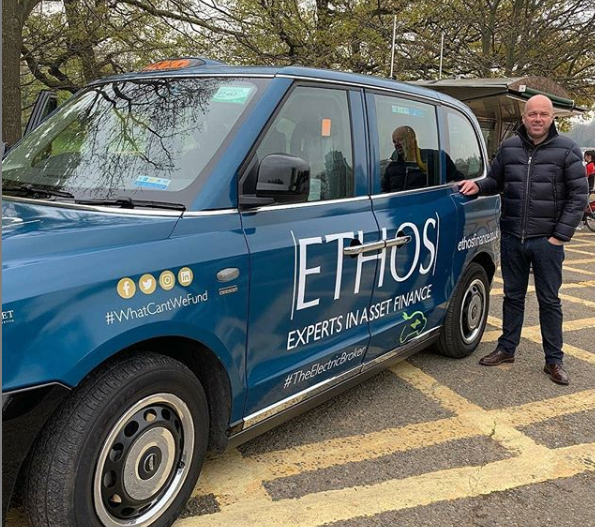 As a part of the campaign Sherbet Ride provided an exclusive pick up – drop off service for Ethos Finance Managing Director and owner Chris Brown during his visit to London. Chris enjoyed his journey in the Eco friendly Ethos Asset Finance branded electric taxi equipped with 4G WiFi, charging points and air-con.